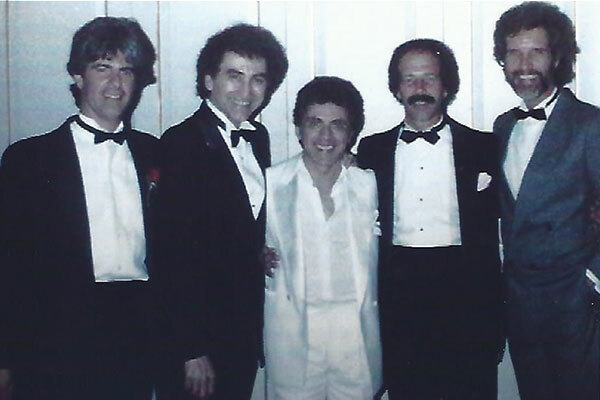 Frankie Valli, center, at his 1974 wedding at the Highlawn Pavillion in West Orange with singers and songwriters from The Four Seasons. 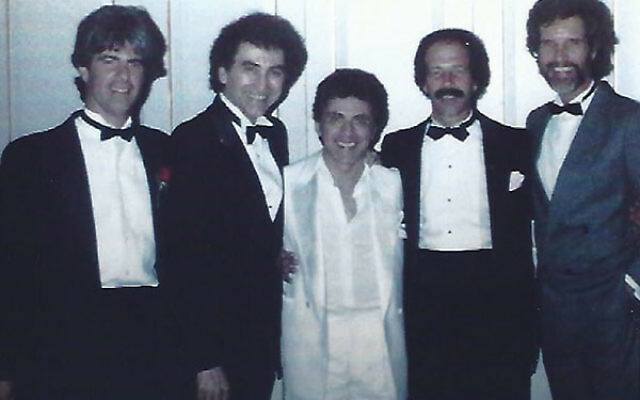 From left, Sandy Linzer, bass player Joe Long, songwriter Michael Petrillow, and singer Bob Gaudio. Sandy Linzer, who was raised on the border of Hillside and Newark, was proud to be among the select few who wrote hit songs for Frankie Valli and The Four Seasons. And as a Jersey boy, he was thrilled when those four songs — “Dawn (Go Away),” “Let’s Hang On,” “Working My Way Back to You,” and “Opus 17” (also known as “Don’t You Worry ‘bout Me”) — were included in the popular juke box musical, Jersey Boys, based on the quintet, which formed in 1961. After a run of more than a decade—it opened in 2005—the Broadway show is scheduled to close Jan. 15. “I thought the show was brilliant,” said Linzer, speaking by phone from his winter home in Boca Raton, Fla. Though he was not part of the production, he said he was financially compensated for his musical contributions. Asked whether being Jewish was an influence on the career he has maintained since his early 20s, Linzer said no. He writes words and music simultaneously. “They both come together. I never took music lessons. I hear melodies in my head and get someone to orchestrate them,” he said. After Linzer and Russo completed the songs, “I asked him ‘What are we going to do now?’” Russo’s music teacher had a connection to The Four Seasons; after the band accepted four of the songs, they helped the pair connect with other songwriters. He continued writing songs for The Four Seasons for three years until the group disbanded. Eventually they reunited and had another run that led to the story of the Broadway show. To Linzer, Valli’s unique high voice was only part of the reason for The Four Seasons’ success, as the lead singer had a keen understanding of the band’s path to success. Valli was also shrewd in surrounding himself with other talented songwriters and performers, including Bob Gaudi, Bob Crewe, and Charlie Calello. As a songwriter and producer, Linzer was one of many people in the pop music world to spend much time in the Brill Building, an 11-story office tower on Broadway and 49th Street, that was essentially ground zero for songwriters. Inspired by the big band jazz era of the 1930s and 40s, Linzer produced the first album of Dr. Buzzard’s Original Savannah Band in 1976. It combined a brass and reed ensemble with a disco sensibility; the album was nominated for a Grammy. A year later Linzer and Denny Randell co-wrote “Native New Yorker” for the disco group Odyssey, then “I Believe in You and Me” with David Wolfert. It was recorded by The Four Tops in 1983 and covered by Whitney Houston in 1996 for her film, The Preacher’s Wife. He considers the song, which he said was an anniversary gift to his wife, Gail, to be his finest composition. They have been married for 52 years and have three children and five grandchildren. His next project is working with a singer named Kris Thomas.